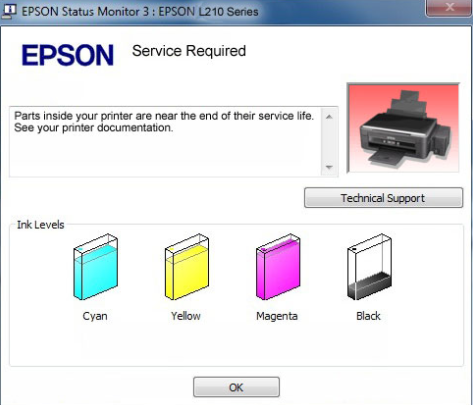 If your Epson printer stopped printing and notifications "Parts Inside Your Printer Are At The End Of Their Life" which means the part in the printer you are approaching the end of usage which is usually shown with your printer ink lights flashing alternately. If it is like that, you don't need to bring the printer to a service center or replace it with a new one. Simply download the Epson Reset Software on your PC then the printer will return to work as before with just a few clicks. Epson Reset software is a program that can be used to reset Counter Waste Ink "on the printer Epson Inkjet that has already entered a period of end of life so that it can be re-used. The use of the Epson Reset Software very saving time, effort, and money. Because the printer does not need to be taken to a service center. Before the Printer can not be used, it will appear the message "Parts Inside Your Printer Are At The End Of Their Life" which means the part in the printer you are approaching the end of usage. When The Printer Is Turned On, The Home Cartridge Not Moving At All. Power indicator light Blinking ink and Tight turns. Support all kinds of Epson printers. Can be used on both Windows and Mac. Can be reset online every time. Equipped with supporting language (the language of the United Kingdom, Spain, French, Mandarin Chinese, Arabic, French, the language of Poland, Turkey, Italy, Romanian). Guarantee of professional service and fast response of Fast Print, guided step by step via telephone, Skype, WhatApps, BBM, Team Viewer, Chrome Remote Desktop (all of your on-demand applications). L100, L110, L111, L120, L130, L132. L200, L210, L211, L220, L222. L301, L310, L300, L350, L351, L353, L355, L356, L358, L360, L362, L365, L366, L375. L550, L555, L551, L556, L558, L565, L575, L566. WorkForce WP-4011, WPM-4011, WP-4015DN, WP-4020, WP-4022, WP-4025DW, WP-4090, WP-4092, WP-4095DN, WP-4511, WP-4515, WP-4520, WP-4511, WP-4515, WP-4520, WP-4521, WPM-4521, WP-4525, WP-4530, WP-4531, WP-4532, WP-4533, WP-4535, WP-4540, WP-4545, WP-4590, WP-4592, WP-4595 - Reading counters only. Reset function NOT available. Download Epson resetter program Online. Make sure Your laptop/computer in circumstances connected with the Internet. Install the program according to your OS (Windows/iOS). Serial input on Epson resetter program. After successfully installed, run the program and wait a few moments program will download new files. The printer is automatically detected in the Program. The program is ready to use to reset the ink pad. A series may only be used for one time process reset on your printer. Don't be closed before Reset your Printer because the series can only be used one time. Make sure the reset process already according to the instructions in the manual the given usage. Software Resetter Epson WIC Program L Series. Assistance to the process of resetting the printer via telephone, Skype, WhatApps, BBM, Team Viewer, Chrome Remote Desktop (all of your on-demand applications). DVD catalog and Manual use.